Made this recipe yesterday as I was in a mood to celebrate Mardi Gras. This cake was wonderful, I give it 5 stars. I made it just as the recipe said and wouldn’t change a thing. Just made this today. 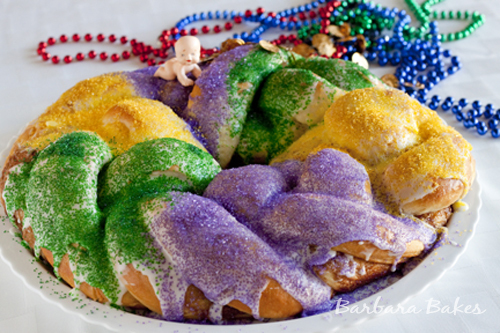 My favorite recipe for king cake ever! Great – glad it was a hit Susan! I’m from New Orleans but live in a different city at the moment. 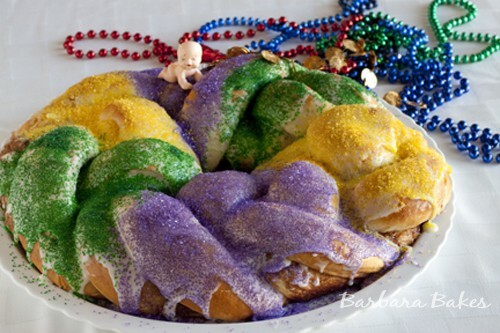 I was really missing home during this Mardi Gras season and had never made a king cake before I found this recipe. Tried it and it was AMAZING! Thank you so much for this authentic recipe. You not only helped me make a bomb king cake, but allowed me to share it with my out-of-town friends and brought back some MG memories through this perfect recipe. That’s awesome – thanks for sharing Mel! I’ve never made a king cake before but made this recipe yesterday for a crawfish boil. It turned out great, and all our guests loved it too! Everyone ate the whole cake and I’m considering making another one today because it was so delicious! Thanks for the recipe. Thanks Megan! I’m so glad to hear it was a hit at your party. You can’t go wrong with making another one to enjoy yourself. Great recipe came out wonderful!! Thanks Sara – it’s just a fun cake. Can you make this without a stand mixer? If so, how? Just a note to say this dough turned out wonderful, waiting on the second rise then bake up for our senior group at the Y . We thought we would do something besides valentines day. Will let you know how this turned out for me ! I followed your recipe to the t only changing the decorations up a bit. I’ve been making king cakes for years and this was the best by far. My niece and I made this cake yesterday. I was a bit nervous because I haven’t had too much success with yeast breads. This cake is beautiful. It came together perfectly. We’ll frost it tonight and have it tomorrow night as dessert for our Fat Tuesday dinner. I’ll look no further for a King Cake recipe. Thank you. Thank you so much for this recipe! I made two of these for an Epiphany party and they were beautiful and delicious. I used regular dry active yeast and did an initial rise until about doubled in bulk, and then let it rise again after filing and braiding. Thanks again. You ended my search for a king’s cake! Great! Thanks for sharing Kirsten. I made the kind cake tonight (DELICIOUS – from the scraps I baked) but I want to bring the bigger cake to work tomorrow. Should I ice it tonight or in the morning? How should I store it in the meantime? Hi Elizabeth – either tonight or the morning is fine. The colors might be more vibrant if you do it in the morning. I would store it in an airtight cake container if you have one. If not, just cover it completely, but not too tightly with plastic wrap and keep it on the counter. Glad you enjoyed it! I love this recipe! I made two of these cakes this year and both turned out beautifully and tasted delicious. 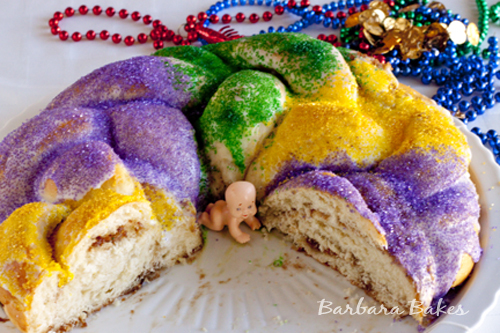 This is definitely my new go-to King Cake recipe! Hi Barbara, when you go to roll out tg dough to put in the filling, do you roll it out on flour or parchment paper or does it not matter? First timer, making it for a king came tasting party! I can’t wait to see how it comes out! Would it be alright to refrigerate the dough for a longer time (like overnight)? I want to make this with my preschool friend, but I only have the joy of watching her for a couple hours in the morning. I was hoping to make the dough the night before. Hi Jamee – yes, you could refrigerate the dough overnight in step 6. It will need time to come to room temperature in the morning before she comes over. Any tips for keeping the cinnamon inside?…I have made this recipe twice this month and each time the cinnamon escapes the braid while baking. Hi Lisa – a lot of the filling bubbles out no matter what you do – it’s the same when you make cinnamon rolls. It does help if you press the dough firm together before cutting it in to strips. Hi Barbara, I am going to try this recipe this week and was wondering if I wanted to use cream cheese, would I put that in place of the brown sugar/cinnamon layer? Also, is there any additional or less time it would need to bake? 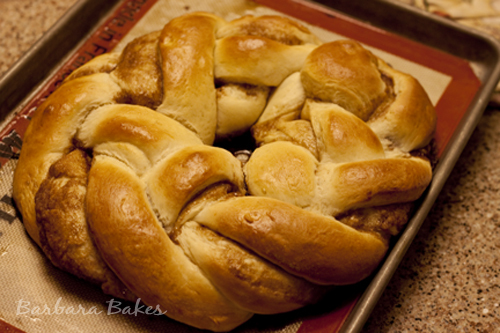 Hi April – If I was going to fill it with cream cheese, I would skip the braiding part and do a faux braid similar to this http://www.barbarabakes.com/citrus-cranberry-cream-cheese-danish-braid-and-a-hodgson-mill-giveaway/. Just make it long enough so you can shape it into a circle at the end and pinch the ends together. I braided it with cream cheese filling once. I had cream cheese every where!! Will definitely try this way next time! Hello! From Louisiana but currently stationed in Japan. I am very eager to try your recipe but I don’t own a stand mixer. Is this possible without one? I appreciate any advice! Yes, you can. Here’s info on kneading by hand http://redstaryeast.com/yeast-baking-lessons/baking-steps-guide/kneading/ Enjoy! I was born and raised in Louisiana. This took me back. Was absolutely delicious. Thank you so much. I completef the first steps and have my dough chilling in a bowl in the fridge. While juggling dinner, a 5 month old and pre-making his dinners I left my dough in the fridge for much longer than an hour… and it looks like it’s going to continue to chill overnight. Is my dough ruined? Will it rise too much? Any advice you can give me to salvage/continue with the cake is appreciated! Hi Heather – your dough will be fine overnight in the fridge. Just be sure it’s in a big bowl because it may rise even in the fridge. I’ve had doughs grow out of the bowl and become uncovered and the uncovered part gets dried out a bit. It will take longer to rise tomorrow, so be patient. But dough is very forgiving and you should be fine. Enjoy! Pardon my language but how the hell did you braid that thing? I tried and everything fell to pieces. Hi Amanda – sounds like your dough may have been to soft. Hi Barbra, I was wondering if I don’t have the hook attachment, could I kneed the dough by hand? How should I go about mixing in the butter? Thank you!